The Network Intrusion Lab (NIL) opened in January 2017 and is a joint project via the continued partnership between UAPD and UA’s College of Arts and Sciences. The NIL is an important component of the Joint Electronic Crimes Task Force (JECTF), and offers unique opportunities to both law enforcement officers and UA students. In addition to its secure research facilities, the NIL hosts training and classroom space for officers and UA students on topics including digital forensics (mobile, computer, and network), network intrusion, and general cybersecurity. Equipment for the NIL was donated by the Office of the Attorney General of the State of Alabama. 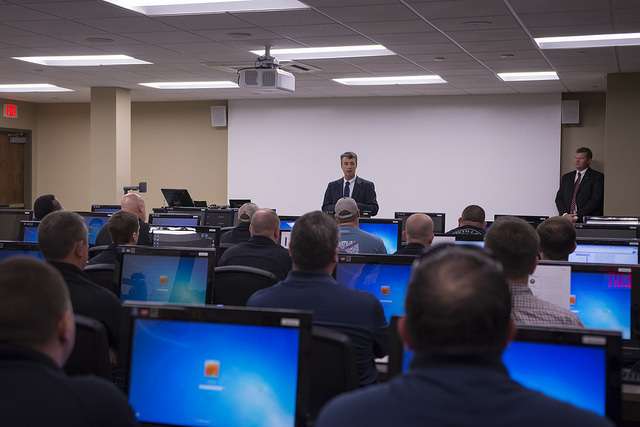 In February 2017, AG Steve Marshall visited the NIL and spoke to a training class composed of law enforcement officers from around the state. General Marshall speaks to law enforcement officers in the Network Intrusion Lab. If you are a UA student and are interested in interning in the NIL, please visit this page for more information.